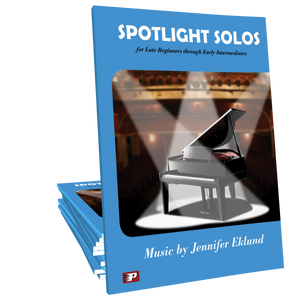 Spotlight Solos PLUS features 10 showcase solos in varying styles and tonal centers. 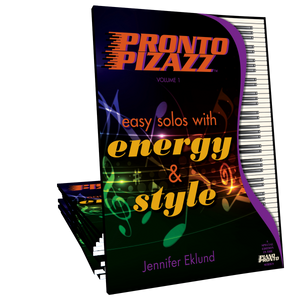 These solos are ideal for late beginners through early intermediates of all ages. Just have to sing the praises of the PP supplements. 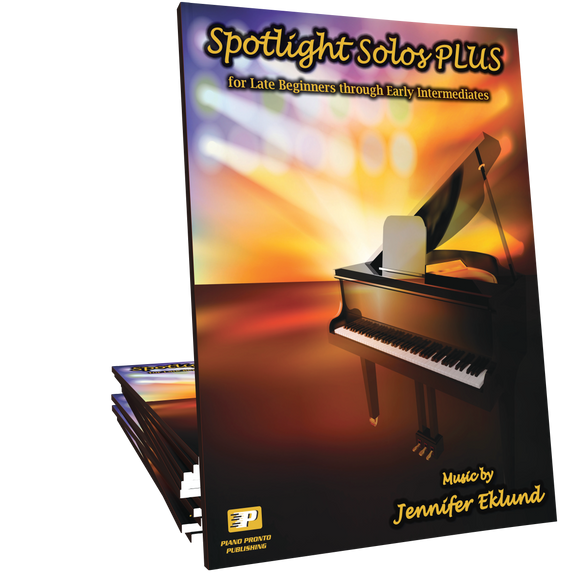 Gave Ella Spotlight Solos Plus at the beginning of her lesson as she has finished volume 1. She worked thought Out of the Blue and then asked if we could spend the rest of the lesson playing through the book. She slowly worked through each song and is so excited to get to learn them. She won't be quitting piano lessons anytime soon. At the end of the lesson she said "and would you just look at this cover - beautiful" She's 12. So many gems in one book! Different moods and flavors to each give students a variety of skills as they work through these pieces....loving the sounds along they way! This collection offers a nice variety of pieces that motivate. Just gave it to an early intermediate student, and these pieces are already helping her to play more expressively! The play along tracks make it easier for me to learn the songs. I love the melodies and look forward working through the songs. So many good melodies here. An adult student fell in love with Shadowfall and she practiced an hour a day - a habit that has stuck through learning lots of other pieces! She got this book and it kick started her love of playing after work for relaxation - so nice as a teacher to find a book to use with a wide age range. I can tell this book is going to be a favorite! Thank you, Jennifer! These play-along tracks take these pieces to the next level! Use these to add some awesome fun to your next recital! Students and audiences have all given then them rave reviews! This is fast becoming a favorite collection in my studio! The music grabs them and they want to play more. 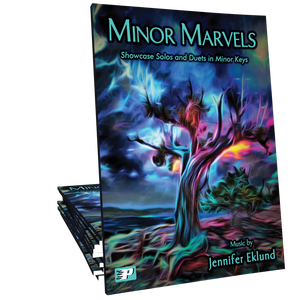 This book has solos to appeal to all students. Differing styles make this a great collection. There has been nothing but excitement!!! My students LOVE these pieces! Shadowfall has been a huge hit and was a student saver for one disinterested teen! My students are loving these songs! It is so much fun to assign a piece and have my students finish learning it in a week! :-) Thanks! Loving this delightful collection! My students are enthusiastic to work on these pieces. 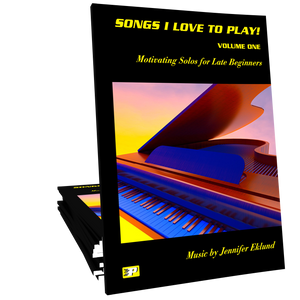 As a teacher, I'm thrilled to offer this collection to my students - we can work on so many techniques and the students enjoy the music; they don't realize how hard they are working! This book is a must have! I first got the digital copy to enjoy for myself. I loved it so much, I'm making it a requirement for my late beginners and intermediates. Thank you for such a great song collection! This is definitely something my teenage students would love to work on! 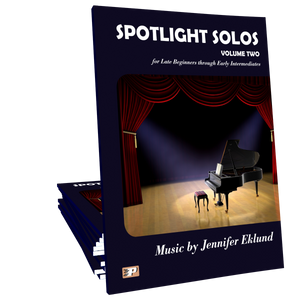 The entire Spotlight Solos series is a must-have for today's teachers. I bought the single license to see how my students would enjoy this new book when I played samples for them, they LOVED it! The pieces are great for Guild & Festival choice pieces. I will also be using the new backing tracks for the spring recital! 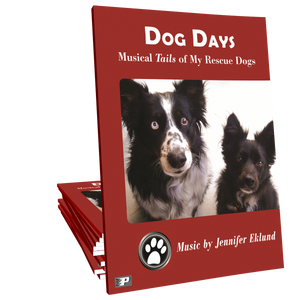 Another great solo collection by Jennifer! All pieces are very well-received by my students. The melodies are appealing to all ages!! This is a great solo collection! Love the variety of songs and all are extremely enjoyable to play! My favorite solo book. All the pieces are beautiful and appealing. My 8-year old daughter is going to learn all the songs. A must have for every teacher and piano student. This is my favorite solo book so far. It's one of those books that every single song is fantastic. This book has helped me with a teen, who tends to waver about piano lessons. Now she is utterly thrilled to be playing these songs. I played the music for an elementary school age kid and she loves them all, too. I highly recommend this book! I looooooooove this collection! The music is great, especially for those teens that are still in method books but want to play "real" music. I'm definitely glad I purchased this collection. Once again, a collection with a lot of appeal to teachers and students! Engaging melodies and various styles, tempos, and key/time signatures make this a great book to add to my studio!